David Blake and Binkie. Photos ©ManciniPhotos. Mill Spring, NC – June 27, 2015 – In another action-packed Saturday evening at Tryon International Equestrian Center (TIEC), David Blake (IRL) and Binkie, owned by Pine Hollow Farm, cruised to victory in the $127,000 Adequan® Grand Prix CSI 3*. The duo bested a class of 35 entries to take top honors. Lauren Tisbo (USA) aboard Entre Nous followed in second with Andrew Welles (USA) and Boo Van Het Kastanjehof rounding out the top three. Competition at Tryon Summer 1 continues Sunday with the $25,000 Under 25 Grand Prix at 2pm in the George Morris Arena at the Tryon Stadium. The Tryon Summer Series will continue through Sunday, July 19. Blake and Binkie won out in a three-horse jump-off as the last pair on course in the class, which Blake used to his advantage. Tisbo and Welles dropped a rail in both of their rounds, which left the door open for Blake to seal the win. The timely decision paid off for Blake, as he and the 2006 Dutch Warmblood gelding, rode a smooth and fault-free round to secure the win. The course, designed by Ken Krome (USA), saw rails drop throughout the night, which Blake commented is the sign of a true course. The pressure was on in the jump-off round, as the riders contested a difficult track with an optimum time of 58 seconds. The long course, after a testing first round, was intimidating, but Blake felt confident as soon as he entered the ring. “Going into fence 1 and 2 I felt like he was really operating tonight and he was really himself, so I said I’m going to play it cool and see if we can go clean. He did a great job and I’m really proud of the way he handled himself out there,” he remarked. When asked about his mental preparation before entering the ring in such a competitive class, Blake commented that sticking to a plan is important when faults are coming throughout the course. “When you see rails dropping, it makes me want to stick to my plan even more and prove that it can work and jump a clear round. I much prefer a class like this than a class with twenty in the jump-off. You really have to work for your clear round. It makes me want to get it done even more,” he continued. The win marked another great effort by Blake and Binkie, who have placed at the top of the leaderboard in nearly every class they have contested at TIEC this season. The duo has a bright future ahead, as Binkie, at only nine years of age, continues to improve and impress. Aoife O’Grady, groom for Blake at Pine Hollow Farm, was the first winner of the newly announced Grooms’ Initiative Award, which is presented to the groom of the winning combination in the largest Grand Prix class above $25,000 during each competition week and will receive $500 as a part of their award. Originally from County Galway in Ireland, O’Grady joined the Pine Hollow Farm team last year to start working with Blake in only her second year as a groom. O’Grady is an essential part of the team in the barn, according to Blake, who was quick to say that none of this would have been possible without her hard work and dedication to Binkie and the entire program. “Aoife absolutely made this possible tonight. She spends so much time with that horse. She loves him to pieces and he knows it and feels it. He tries hard not just for me but also for her and I really have to thank her for that,” said Blake. For more information on TIEC and for a full list of results, please visit www.tryon.com. 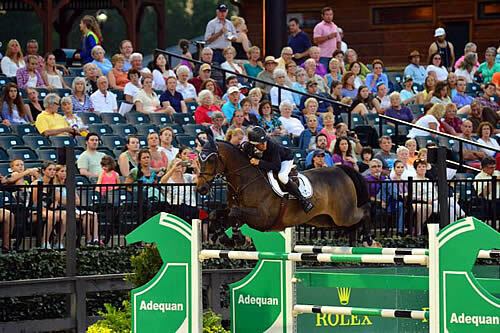 The Tryon International Equestrian Center is destined to become one of the premier centers in the equestrian world. This new facility opened in June 2014 with sanctioned horse shows and initial supporting amenities including 10 riding arenas, 850 permanent stalls, a covered riding facility and fitness center. Future expansion includes a sports complex, two hotels, sporting clay course, and an 18-hole golf course plus a full calendar of equestrian competitions and activities. It is a spring, summer and fall haven for eastern and northeastern American equestrian competitors and enthusiasts. For more information, call 828-863-1000 or visit www.tryon.com.